When’s a knife not a knife? It’s when the cutting edge is dull, which is why you need the best knife sharpener that fits your needs. The main problem, of course, is that it’s not always easy to buy the knife sharpener on the market. There are many types of sharpeners, and you need to take note of the type of knives you have. You also have to take your personal preferences into account. What’s more, the wrong knife sharpener won’t just waste your money but it can ruin your knives too. So what is the best knife sharpener? To answer that question, we’ve compiled several excellent sharpeners of different types with different features, so that you may find that fits your exact needs. Work Sharp WSKTS-KO Ken Onion Edition. This is the electric knife sharpener you need when you have knives of all types, plus scissors and even yard maintenance tools to sharpen. It’s so easy to use that knife sharpening stops being a chore but becomes a fun hobby. Chef’s Choice Trizor XV. This is what you get when you need something for your 15-degree angle Asian knives. You get fat results from this sharpener, and the resulting sharpness of the cutting edge is terrific. Work Sharp WS3000. This is the sharpener you need if you’re a woodworker and you need to sharpen your woodworking tools like your chisels and lathe tools. You can also use this for various types of knives, including hunting knives and gourmet knives. Chef’s Choice 1520. Here you have 3 slots you stick your knife in. One is for Asian knives, the other is for Western knives, and the third is for the finishing touches for both—and for serrated blades. There’s even a 3-year warranty. Chef’s Choice 120. It’s not just for gourmet Asian or Western knives. It also works for butcher knives and hunting knives. They all get that sharpness brought on by the special 3-stage process and you get a 3-year warranty. Presto 08800 Eversharp Electric Knife Sharpener. It’s cheap because it’s an old design, but it’s a design that works. You can use this for all your kitchen knives, and you can throw in your yard maintenance tools too. If you’re looking for the best knife sharpener kit, many consider this a likely contender. What really sets it apart is that it’s very versatile, as you can use it to sharpen kitchen knives and hunting knives. In fact, it’s not limited to just knives like pen knives and fishing knives. You can use this to sharpen an axe or a machete, and even the blades on your lawn mower. These are great with scissors too. In fact, there’s a scissor guide built in with a 65-degree angle. For the other blades, you can adjust the angle from 15 to 30 degrees. You can choose among 1-degree increments, and all you need to do is to turn a knob for the angle you want. This is a kit with various grades of abrasive belts for different types of knives, and you can just buy other optional attachments if you need to use it for ceramic knives or for precision tools. It’s so versatile that you sharpen just about anything that can be sharpened in your home. All you need to do is to buy an optional attachment, instead of a separate sharpener. It uses abrasive belts that last long because it continuously uses new cutting surfaces so the wear is even. Regardless of what you sharpen, it’ll come extremely sharp. We’re not the only ones who say this, as countless best knife sharpener review written by customers have confirmed that their dull knives seem like new again afterwards. Adjusting the angle doesn’t require jigs or special tools. Just turn a knob. It’s not just easy to use—it’s actually fun to use. You may end up looking for various tools in your garage and attic to sharpen just for the chance to use this sharpener again. You will want to practice using this at first, and that means you need to have cheap knives that you don’t mind ruining to work on. If you like to get near the blade to see if it’s sharp enough, eye protection is an absolute must-have. A face mask is a good idea too. There are some shavings to the side that you’ll need to deal with afterwards, especially if you’re sharpening the blade for the first time (and not just retouching the edge). This is the knife sharpener best only for 15-degree knives, though you can use it to convert wider angle knives to the Asian style. You may want to do that because this conversion can turn a knife into a more effective cutting tool, and it may last longer too. It also prolongs the lifespan of the knife by minimizing the amount of metal it takes off from the knife. This is via a 3-stage process, with diamond abrasives of varying coarseness for the first 2 stages, then a stropping disk for the 3rd stage. This stropping disk can also work in sharpening your serrated knives too. That means even your bread knives can improve. We’re not the only ones who have high regard for this sharpener. Cooks Illustrated named it the best knife sharpener of 2015, while America’s Test Kitchen also gave it a rave review. It can deal with serrated knives as well. There’s not much of a learning curve for it, and it doesn’t require much effort. The 3-year warranty is also in effect. Despite its price, it’s limited to just 15-degree knives. Are you looking for the best sharpener, not for knives, but mainly for your woodworking tools? Then look no further, as you’ve found it. This is a sharpener that’s designed primarily for lathe tools, carving tools, chisels, and plane irons. There’s also a sharpening port that can accommodate blades with widths ranging from 0.125 inches to 2 inches. If you know how to sharpen freehand without a guide, then you can use this for larger blades too. Meanwhile, you can just adjust the angle from 20 to 35 degrees, and you have preset angles to choose from for consistent results. If you’re a woodworker, your needs aren’t forgotten. You now have a tool that’s designed specifically for the tools you use. At the same time, you can still use this for a wide variety of knives. It comes with an instructional DVD, so that you can watch what to do instead of just read about it. It offers 16 different types of abrasives. It’s not really easy to master even with the DVD. Yes, it has lots of accessories. Where’s the case to put in everything? The 1520 tag is because it can sharpen both Japanese knives (which are usually at 15 degrees) and American and European knives (20 degrees). Many chefs don’t limit themselves to a single style, so this is a very suitable option for these chefs. What really helps sell this sharpener is the utter simplicity of the design. You just insert the knife in the proper slot in the sharpener, and you’re good to go. One slot is for 15 degrees while the other slot is for 20 degrees. The 3rd slot is for the finishing touches, and you can also use this slot to sharpen your serrated bread knives. It’s very easy to use, and it helps that the instruction manual is very well-written. You don’t have to struggle to understand it. Once you understand how to use it, you can sharpen knives in no time at all. Even newbies will only take half an hour or so to sharpen 8 knives in one sitting. The sharpness you get is admittedly terrific. A sharpened knife is like it is brand new again, or even better than brand new. The main exception to how easy it is to use is if you use it for serrated knives. Some people just can’t get the hang of it. You can’t use this for your scissors. If you also have ceramic knives, you’ll need another sharpener for them. 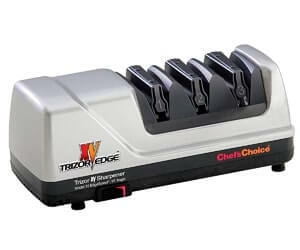 Chef’s Choice sharpeners are known for their excellent 3-stage sharpening process that uses diamond abrasives, along with their terrific 3-year warranty. All these are present in the 120. Still, some Chef’s Choices sharpeners can only be used for the certain specialized type of knives. This time, the gloves come off and you can sharpen more types of knives. This means you can sharpen not just any type of gourmet knife, but you can also restore the edge of the knives you use for butchering. It works for serrated knives too, and even hunting knives can get back their sharp cutting edge with this. It’s so easy to use that some people call it “idiot-proof”. In any case, it’s normal to need to practice it first before you master it, though that shouldn’t take too long. It offers fast touchups so that you can make sure that every knife is as sharp as can be when you use it. The 3-year warranty is still there. When you practice, you may end up ruining your practice knives. That means you need a cheap knife that you don’t mind losing to work on. Even with lots of practice, many chefs say that this is not ideal for expensive knives. It’s best reserved for midrange and very affordable knives. Chef’s Choice sharpeners are notorious for scratching up knives because of dislodged diamond dust particles. This won’t affect the usefulness of your knife, though it won’t look as good with its minor scratch. Who says every good electric knife sharpener has to cost more than a hundred bucks? Not Presto, apparently, since this one costs under 35 and that’s with the delivery included. You don’t even have to worry about low quality because the low price here doesn’t mean that Presto used cheap materials for this. The low price is because the design was launched many years earlier, and now new designs have entered the market, that’s all. Have we mentioned the price yet? The price here means that your search for the best cheap knife sharpener doesn’t have to exclude electric models. It’s not just for knives, as you can also use it for other yard maintenance tools. It really gives a sharp edge, so that even a single pass will do fine. It also comes with a 1-year warranty, but you’re on your own if the damage is due to the delivery. Since this is an older design, it’s not as easy to learn and use as more modern sharpeners. Since you need a sharpener for your knives, why not buy a knife and sharpener set? That’s what you get here: it’s an 18-piece knife block set with an in-block knife sharpener. What this means is that you get 17 different knives with high-carbon stainless-steel full-tang blades, and there’s an extra slot to sharpen every knife in the set. There’s no fuss at all. Now you don’t have to figure out which sharpener is best for your knives. This time, you already have one that’s designed for all your knives. There’s nothing to figure out, as you just stick the knives in the sharpener slot to touch them up. You get lots of different knives, yet the whole set costs less than some of the sharpeners here. This even comes with a limited lifetime warranty. You probably won’t be able to use this sharpener for your other knives. The knives are square in shape, so they often land sharp side up. Be careful! This is our main exception to our “hundreds of reviews” criteria, and that’s not because it’s not popular. It’s mainly because it’s still comparatively new, so it hasn’t had much time yet to gather a huge number of customer reviews. It’s also not an electric sharpener, but a manual device that uses water stones. You hold the knife with your left hand (if you’re right-handed), and then you use your right hand to move the stone on the rod over the cutting edge. There are lots of videos you can watch online for this, and you can also watch how to set up the system. This can last for a very long while, as the only maintenance it needs is routine cleaning. You will only have to replace the stones whenever that’s needed, and they’re cheap at $20 or so. The angles can be adjusted. There’s no heat to damage the temper of the blades. This can handle knives up to 3.5 inches wide. You have to set it up each time you take the kit from the bag. It’s very expensive, as this A1 is the basic kit and it has only 2 stones. You also need to practice a lot to master its use, and in the video, the expert says that you may have to mess up about 10 to 15 knives before you get the hang of it. Some people want a pocket sharpener that goes well with their pocket knives, or for camping. If that’s you, then this is what you get. This one is like the Swiss Army Knife of sharpeners. There’s a carbide slot and a ceramic slot, and then there’s a tapered diamond rod that works great for serrated blades. You also get preset angles so you don’t need to fiddle with anything. It’s so portable, since it’s only 3.5 inches by 1 inch, and it weighs 1 ounce. There’s even a lanyard hole. The carbide blades and ceramic stones are reversible and replaceable. It’s cheap, as in about $6 cheap. If you’re sharpening a number of dull knives, you’re going to need a lot of time. Not everyone can get how to use this properly. Despite the name of this device, it’s not limited to sharpening your knives. You can also use this to sharpen fish hooks, awls, punches, and even your darts. It’s also not an electric device either. Instead, it has a base in which there’s a steel rod, which you then use to sharpen your tools. Your purchase already comes with 2 ceramic stones, and all the parts can be put into a free carrying bag. There’s also an instructional leaflet and a DVD, though you can watch this video online so you get a better idea of how to use this thing. It’s portable, and it even comes with a carrying bag. 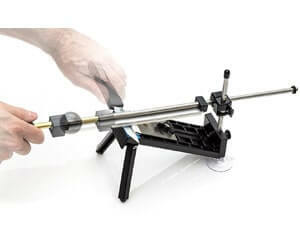 If you want, you can bolt it to your tabletop or countertop as it’s already drilled for bolting. The stones work dry, so there’s no need for lubricants, oil, or even water. This can work for a wide variety of items, and not just knives. It seems complicated to learn. Even when you learn to use it, it takes a while to get a sharp edge. You have to read a lot of reviews. Start with our knife sharpener reviews, and then follow the links for the seller’s page where there are also lots of customer reviews. These reviews can provide a more accurate idea of what you can expect from a particular knife sharpener. Keep in mind that sometimes the admin may describe what seems like the best knife sharpener in the world. But the customer reviews may tell a different story. Pick only those with high average ratings. It’s a rule of thumb in online shopping, that top rated knife sharpener models with high average ratings are those that will probably work very well. As much as possible, also choose among the more popular models. These top knife sharpener models are popular for a reason, which is why they have high ratings and hundreds (or maybe even thousands) of reviews. Also pay special attention to the most recent reviews. When a sharpener has been on the market for several years, a manufacturer may suddenly decide to reduce the quality of their popular and widely-praised sharpener. At least with the new best knife sharpener reviews, you can be sure that the recently made units are still as good as the earlier ones. What do you want to sharpen? Some people just want a sharpener for their prized Japanese sushi knives. Or perhaps you want to sharpen just about everything with a cutting edge in your home, including your hunting knives, scissors, yard maintenance tools, or even woodcarving tools. So when you read the product features, check if it can accommodate what you want to sharpen. You can confirm these capabilities in the customer reviews as well. Get your priorities straight. Some people prefer to buy the best budget knife sharpener only from a certain price range. That’s understandable (we’re not all rich) but you can’t just get the cheapest model and call it a day. Check just how sharp the knife gets after using a sharpener by reading the customer reviews. Usually, a really good sharpener will have most reviewers remarking on just how sharp their knives become afterwards. You may want to also read about how easy it is to learn to use a sharpener, how easy it is to use, and how quickly you can sharpen knives. Some types of sharpeners (like wet stones) may take as much as half an hour to sharpen a knife, while an electric sharpener may take only a few seconds. Read the tips on how to use the sharpener properly. Can you be sure you can follow those instructions and tips? If they’re too complicated, you may need a simpler model. Even the best rated knife sharpener is useless for you if you can’t use it properly! The best knife sharpener here depends on your needs and preferences, and we can’t really know what that is, to be honest. So the truth is that you’re the best judge to determine what’s the best knife sharpener is for you, not us. Having said that, here’s the thing: there’s really something unique about the Work Sharp WSKTS-KO Ken Onion Edition. It doesn’t just provide sharp knives or that it’s very versatile. It not only that it’s easy to use. The others may be easy to use and offer sharp edges for your knives afterwards. But none of them are as addictive as the Work Sharp WSKTS-KO Ken Onion Edition.